Hyundai’s first attempt at a rear wheel drive sports car is undoubtedly a flawed piece of machinery. Can enough merit be found in tuning the Genesis Coupe to make it a Jalop’s ride of choice? On paper the 2010 Hyundai Genesis Coupe is not that exciting. You get either a watered down version of the 4B11T four cylinder turbo or a V6 with power per displacement that falls short of Ford’s 3.7 liter Mustang engine. Your choice of power-plant is bolted to either a lame 6-speed automatic or an occasionally ill-assembled 6-speed manual transmission. The car isn’t quite as light as you’d want and, as a result, its acceleration stats don’t stand out either. The “Track” version of the GenCoupe brings along biggish Brembo brakes and a Torsen rear diff, but these parts do little more than match similar goodies available on other cars in the segment. Hyundai has no established history in making great performance cars, and while they have an excellent warranty these days their brand cache is not as strong as what Honda or Toyota still enjoy. Given such a lack of outstanding characteristics, the prospective Genesis Coupe owner must then face the car’s significant flaws. ...and cracking. Light pods in general can be a problem on the car. They’ll develop leaks and fill with condensation far more often than buyers would hope. Granted, this is a bugbear of many modern cars. Genesis Coupes without the Brembo brake option have a spongy pedal feel. They take a good few stomps to go soft, but once they do they don’t recover quickly. Finally, and worst of all, is a crippling lack of front bump-travel that can become catastrophic when a Genesis Coupe is improperly lowered. In the real world the car struggles to soak up mid-corner bumps and when driven hard will experience a sudden loss of front axle grip when it bounces off its bump-stops. This can lead to seriously pant-soiling moments if you happen to go over some bumps while you’re on the brakes and steering input is applied. The damping also isn’t great, and the car can be unsettled by surprisingly small bumps at speed. The so-called “performance aftermarket” becomes slightly exposed here in that much of their tuning of the Genesis Coupe is cosmetic. If maximum real-world on-street performance was the true goal then all tuned Genesis Coupes would be tastefully lowered at the very most. Given these circumstances, potential owners might be led to think that the Genesis Coupe is irretrievably flawed, and that turning to the after-market for help will only serve to make the car worse. But no! The Genesis Coupe is, in fact, a rather intriguing opportunity for improvement after purchase. Hyundai had grand ambitions with this car. What they really wanted was a modern-day E46 M3. That mark was certainly missed, but in doing so Hyundai left behind a collection of parts that we think can be built into a highly entertaining motor vehicle. A Genesis Coupe owner is limited on selection of quality after-market components compared to, say, someone who bought a Mustang instead. That said, some very impressive brands have turned out killer parts for the GenCoupe including ACT clutch components, OS Giken driveline parts, and suspension wizardry from KW. Here, now, in 2016 the after-market has finally started to mature for first-gen Hyundai Genesis Coupes. As for the cars themselves, cheap gas has made the trade of sportscars and trucks/SUVs back into a seller’s game. However, ‘brand value’ is still nice and potent; so the Genesis Coupe sits in the market with a big old turd of a Hyundai badge plastered to its grille. This makes a comparable Nissan 370Z far more expensive to buy. That said, an equivalent 2012 V6 Mustang costs a couple grand less on the second-hand market, so it’s not all good news on pricing. Even so, tidy 2010-2012 V6 stick-shift Genesis Coupes can be had for thirteen to fifteen grand; twelve if you look hard and haggle. This means, even if you go nuts on after-market parts and labor, you’d be hard-pressed to break $30K all-in on a very nicely built GenCoupe. Such a vehicle might really start to feel like a reincarnated M3, and certainly represents a unique take on the time-tested pony car concept. So, in the end, is it worth investing in such an odd-ball platform as the Genesis Coupe? Are we idiots? 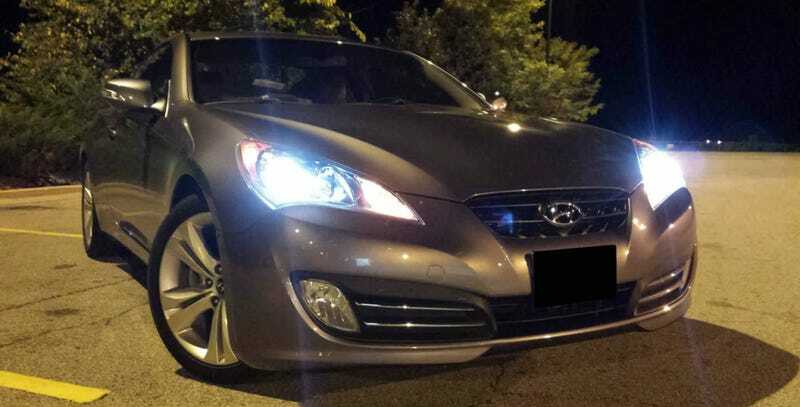 We just spent seven hundred and eighty two words generally taking a crap on the Genesis Coupe. So why the hell would we buy one!? For the answers to these questions and more, tune in to the next edition of Project Hoondy!